Marching on in a strange new world . 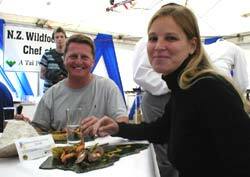 . . . .
With nowhere maybe stranger than at Hokitika on New Zealand's West Coast; on the second weekend of every March, the Hokitika Wildfood's Festival is on again. But amongst all the wild and wonderful foods, amongst all the madness and the mayhem there is a corner of sanity, there is some sanctuary. 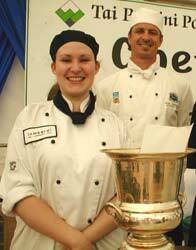 I talk of course of the New Zealand Wildfoods Festival Chef of the Year competition. Somewhere you can sit in much needed shade, relax and watch as nine of the country's top chefs compete for the prestigious title. The ingredients may be wild, but these chef's prepare and present it with such love and devotion that one is forgiven for forgetting that the dishes contain some very unusual foods. There was no end of volunteers to try these astounding dishes either, and they were from all walks of life - the young, the old, Kiwis and overseas guests alike. They had one hour to prepare, cook and present four portions of a dish created themselves, from ingredients chosen and in some cases, hunted, dived or gathered themselves - such is a chef's dedication to using the best and freshest ingredients some times. So with the steel of their knives flashing, hands chopping, slicing and dicing faster than seems safely possible these chefs went to work under the watchful eye of not just the judges but also several hundred members of the viewing public. This year the audience even managed to get close up and personal with the introduction this year for the first time of a large projection screen, to watch even the smallest of details and techniques on. Judging this year's event was a face known to most of the country, guest judge Gregg Heffernan of Taupo along with Chef Tutor Jos Wellman of Tai Poutini Polytechnic. 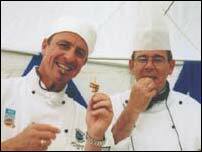 Judging to accepted international standards, it was not just about how the final dish finally looked and tasted. The chefs were marked on areas such as professional practices, techniques used, degree of cooking, creativity and overall balance of the dish. Back for a second year of judging, Chef Greg Heffernan said "The level of competition this year was even higher than 2003, with a myriad of ingredients being used and prepared to a standard as high as I have seen anywhere in the world. They represented not only themselves and their restaurants highly, but at this internationally known event, they did New Zealand proud too". Chef Greg went on, "the judging was tight, with only a matter of points separating the overall winner from the other top competitors"
Chef Christine Nichelson representing the Mecure Hotel, St Moritz in Queenstown. This is the second year in a row this establishment has taken the title, with their sous chef winning last year. Seen here with guest judge Chef Greg Heffernan is Chef Christine. "This dish is inspired by a journey through New Zealand's South Island to source the wild ingredients. The journey began in Nelson for kumara and continued east to the Kaikoura ranges where the best wild boar in New Zealand is hunted. We then travel to South Canterbury to pick up the last of the season's wild blackcurrants. Via Burkes Pass and the Lindis, our expedition takes us to Central Otago where we gather ripe rosehips along the shores of Lake Dunstan. Brinza cheese is sourced from Gibbston Valley at the foot of Kawarau Gorge. Further south, we find wild spinach and begin our return north. Via Haast Pass and Westland, we pick pikopiko fern fronds in the bush and gather wild watercress in a mountain stream. Our journey ends in Hokitika where broomflower wine completes our vision"
"While each dish and chef is judged individually and to a set criteria, Christine scored highly not only on her final dish - its taste, presentation and balance (of colour, flavour, textures and ingredients) - but she scored very highly on all the other areas also. She was extremely well organised, her hygiene standards were exemplary and she displayed a level of overall professionalism well beyond her years. The practice and training put in to her culinary techniques shone through. Her inspirational use of pounamu (Jade) slates as her serving plates set off the dish wonderfully". See you all there next year?